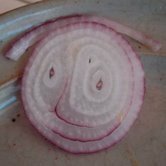 Red Onion Smiley, Don’t Cry! We were having bagels for lunch. Everyone who wanted sliced onion on theirs had taken some. And there was this one, just sitting on the plate!